The AJC’s Mark Niesse and Rhonda Cook will be reporting live from inside the courtroom during the retrial of former DeKalb County CEO Burrell Ellis. Ellis is accused in a nine-count indictment of using his power as DeKalb’s leader to extort campaign contributions from county contractors. For more coverage of the corruption case against Ellis, visit MyAJC.com. Opening statements in #BurrellEllis retrial offered a broad preview of the case but jurors will have to hear evidence for themselves. 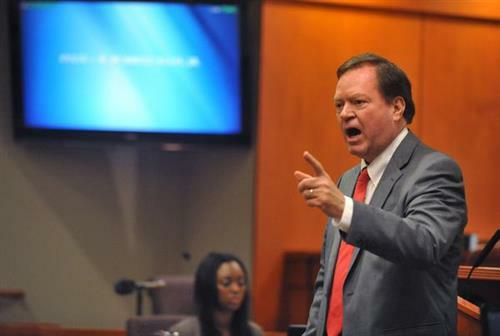 Opening arguments are over in the #BurrellEllis retrial. The trial will begin after a short break. "It was not about campaign contributions" when #BurrellEllis had a dispute with a contractor, says defense attny. It was about respect. Defense attorney Craig Gillen tells jurors that DeKalb CEO Burrell Ellis pursued contractors who didn't return his calls, but Gillen says Ellis didn't threaten them. #BurrellEllis said on a secret recording: "I don’t want people to have a criteria they give to me as to whether they can do business." Prosecutors’ top witness, ex-purchasing director Kelvin Walton, lied multiple times under oath--#BurrellEllis defense team. Defensegoing after top witness, the county purchasing director under #BurrellEllis : "He lied, and then he lied, and then he lied again"
#BurrellEllis atty:"The evidence will show that there was no threat to" vendors. The jury in the retrial is made up of six women, six men; seven black and five white. They'll decide on nine counts against Ellis, including extortion, attempted extortion, bribery and perjury. #BurrellEllis defense going thru counts individually. Prosecution objects=statements on law. Judge: court will instruct jury on legal defs. There will not be any evidence of any kickbacks.--#BurrellEllis 's atty. #BurrellEllis ' Attorney Craig Gillen: "Not one thin dime went into Ellis' pocket that wasn't supposed to be there"
Prosecutors are done with opening arguments. Defense is up now in #BurrellEllis retrial. #BurrellEllis didn't line his pockets, didn't get kickbacks and didn't personally benefit from campaign fundraising, defense attny says.